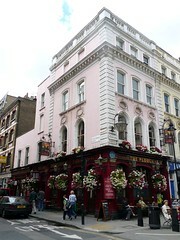 Taylor Walker pub in Bloomsbury, convenient to the British Museum. Its location means it will always have the tourists in, especially during the Museum's opening hours. However, in its favour it's quite a large pub for the area, divided into two rooms, with large-screen TVs in both showing news or sporting fixtures (sound off most of the times), and the bar running between them. There is a mix of table and banquette seating. There's also some seating outside. On a Thursday evening in July 2013, the outside seating was full at 6pm but there were still a couple of seats available inside. It also has real ale on handpull. There are four pumps in the front bar and five more in the back, as well as a good selection of draught lagers including Staropramen and Beck's Vier. In June 2009, the ales were London Pride, Old Speckled Hen, Brains Rev James, and Abbot Ale. In July 2013, they were Marson's EPA, Sambrook's Wandle, Greene King Old Golden Hen, and Woodforde's Wherry; Weston's Rosie's Pig cider was also available on handpull. In July 2013, lime and soda was a pleasingly cheap 40p/pint. There's a dining room on the first floor, which on Wednesday evenings hosts a quiz night (7:30pm, £2 entry according to a sign on the door in February 2008). According to the Taylor Walker website as of July 2013, food is served 11am-10pm Mon-Fri, noon-10pm Sat, and noon-9pm Sun. Accessibility: The toilets are on the first floor, up a straight flight of stairs with a sturdy handrail on both sides. Last visited by Kake, July 2013. Opening hours taken from the Taylor Walker website, July 2013. Last edited 2013-07-13 10:21:38 (version 12; diff). List all versions. Page last edited 2013-07-13 10:21:38 (version 12).